THE Bulawayo City Council recently mooted plans to have former mayor, Alderman Martin Moyo awarded one of the mayoral cars for free or a paltry $3 000, as part of his exit package, it has emerged. The move comes despite the local authority having, last year, insisted that they were abandoning a policy where former mayors will be given the option of purchasing vehicles they used during their tenure at book value. Ald Moyo was at the local authority for two terms — one as an ordinary councillor and the next as a mayor — before being defeated by the current deputy mayor, Councillor Tinashe Kambarami in the Ward Three Local Government elections. According to a council confidential report council’s financial director, Mr Kimpton Ndimande had recommended that Ald Moyo be given two options that of being given a Mazda BT50 for free — as it had no book value — or purchase a Chevrolet, which is also part of the mayoral fleet, for $14 732. “The financial director noted that in terms of policy, out-going mayors were afforded the opportunity to purchase the vehicle they were using while still in office. “Council did not have a depreciation policy, however, financial services were being guided by the accounting standards of best practice in this particular issue. In this instance the book values of the mayoral vehicles should be adjusted. “In light of this Mr Ndimande recommended that the BT50 be given to the out-going mayor for free as it carries no book value or as the depreciation value for the Chevrolet Trailblazer is $25 400 and going by the precedent of former mayor Alderman Thaba Moyo, it be disposed at, 58 percent, this being $14 732,” reads part of the report. Ironically in the same report it is stated that when the Mazda BT50 was valued for insurance purposes it was pegged at $20 000. When his tenure ended, Ald Thaba Moyo was sold a Dodge Journey vehicle for $7 500 despite the book value being pegged at $13 000. In debating the motion, some councillors supported the move to give Ald Martin Moyo more of a golden hand shake by awarding him the Mazda BT50 for free, while others felt it would be unjustified considering the burden would be on the ratepayers. “The town clerk (Mr Christopher Dube) explained that the matter had been re-examined by management which felt it advisable to follow precedent. 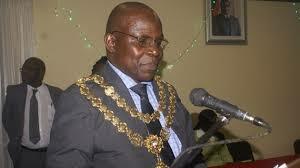 “Ald Thaba Moyo had been offered the mayoral vehicle at a discount of 58 percent of the book value. In this instant this would translate to zero for the BT50 and $14 732 for the Trailblazer. “The mayor, Clr Solomon Mguni observed that the general sentiment was that Ald Martin Moyo had given invaluable and selfless service to Bulawayo . . . the deputy mayor, Clr Tinashe Kambarami recalled that the view at the previous meeting was that the BT50 be offered at $5 00, this would still be affordable to him. Clrs Silas Chigora and Siboniso Khumalo did not support a free gift as this would be unjustifiable to the ratepayer,” reads part of the confidential report. After further deliberations councillors decided that the former mayor be given the option of purchasing the Mazda BT50 at $3 000 or the Chevrolet Trailblazer for $14 732 and the vehicle of choice be fully serviced upon offer to the former mayor. authority headaches over the years, with residents constantly questioning their priorities.